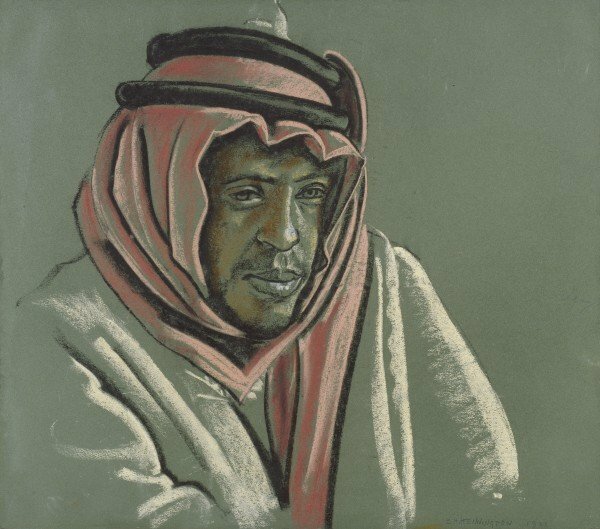 At the end of Part 1 of this blog about Eric Henri Kennington we had reached a point in his life when he had travelled to Arabia to prepare sketches which would later be used in his friend, T. E. Lawrence’s 1922 book entitled Seven Pillars of Wisdom. 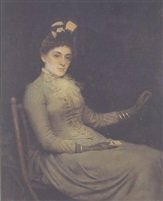 In 1922, Eric Kennington first met Edith Cecil when he received a commission to paint a portrait of her husband, William Charles Frederick Hanbury-Tracy, 5th Baron Sudeley, whom she married in August 1905. They had no children. Kennington and Edith fell in love and in 1922 she and her husband divorced and in September 1922 she married Eric Kennington. The couple went on to have a son, Christopher, in March 1925 and a daughter, Catherine in February 1927. It is said that both Eric and Edith remained on friendly terms with Edith’s ex-husband. 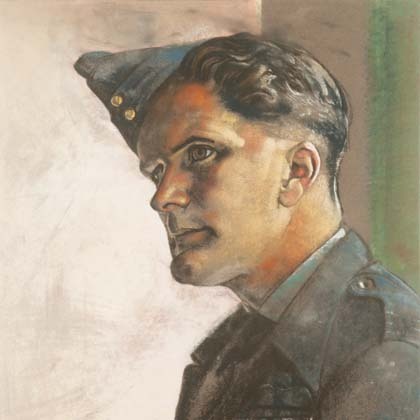 Eric Henri Kennington, as well as having been a war artist during the Great War, was also a revered portrait painter. 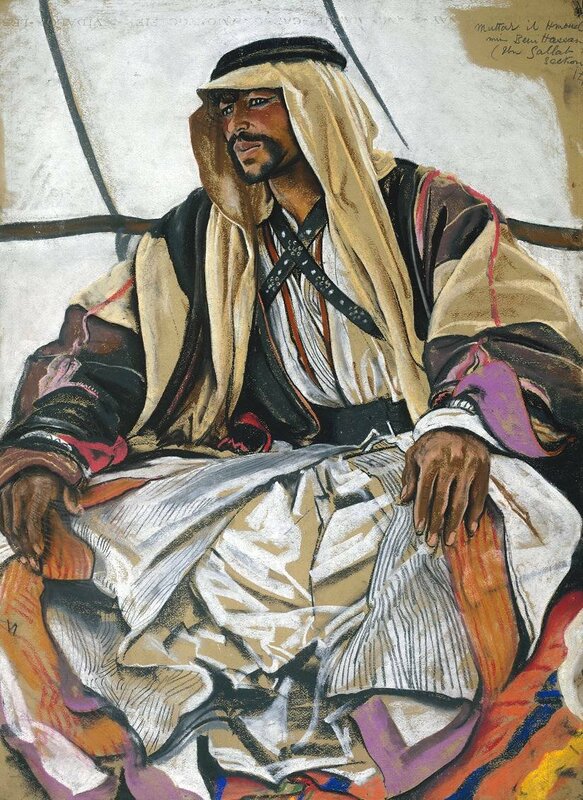 During his time in Arabia sketching and working on paintings for T E Lawrence’s autobiographical book, Seven Pillars of Wisdom, he met Field Marshal Allenby. 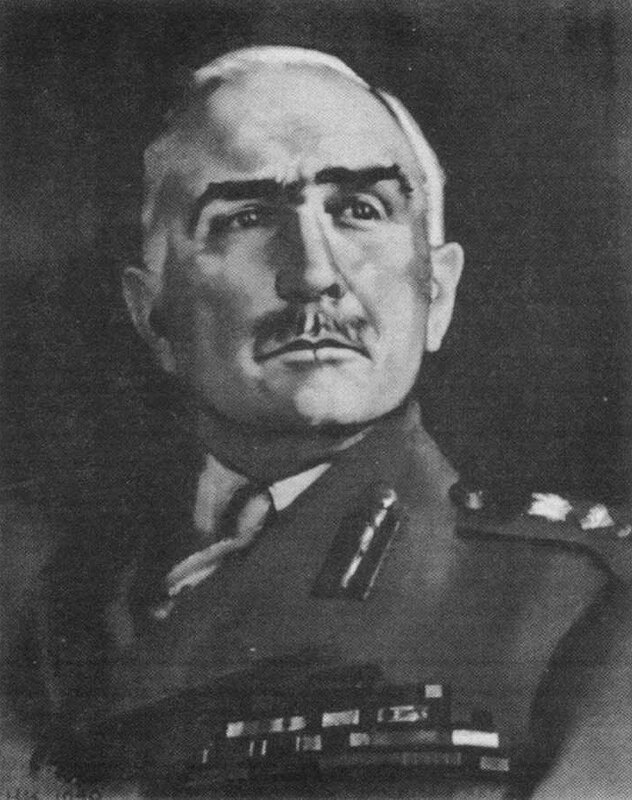 Allenby, at that time, was the High Commissioner for Egypt and was based in Cairo. In March 1921 Kennington met Allenby at the Semiramis Hotel in Cairo and produced a pastel portrait of Allenby. 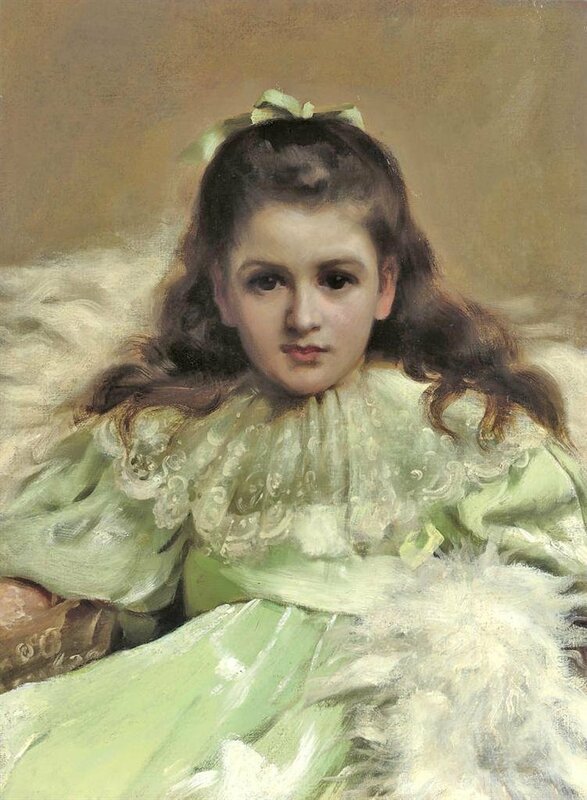 It is remarkable to think that this pastel work was completed by Kennington in less than an hour. At the outbreak of the Second World War in 1939 the War Artists Advisory Committee was formed as part of the Ministry of Information. The chairman of the new committee was Sir Kenneth Clark. Clark who had been a fine art curator at Oxford’s Ashmolean Museum, had, in 1933 at age 30, become the director of the National Gallery and as such was, and still is, the youngest person ever to hold the post. One of the artists he chose was Eric Kennington, as by this time, he had built up a reputation as a leading portrait artist. 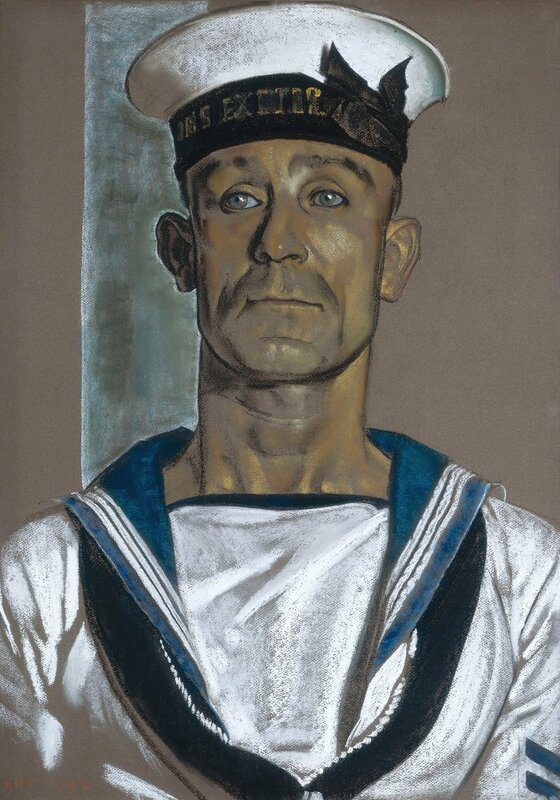 Kennington became a war artist for the second time in December 1939. 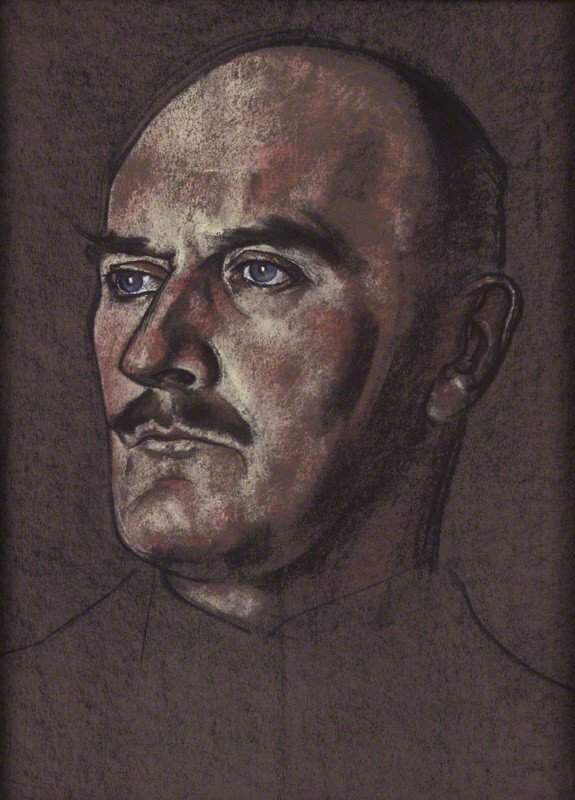 His contract with the War Artists Advisory Committee was to produce pastel or charcoal portraits and for each one he would be paid 25 guineas. Kennington agreed but said he would need a minimum of three hours per sitter. Kennington, as was the case during the First World War, soon clashing with his “employer” the War Artists Advisory Committee principally because of his personal dislike of Colin Coote, a journalist, who was the War Office representative on the committee. In May 1940 the Home Guard, the Local Defence Volunteers was formed and Kennington decided to leave his role as a war artist for the War Artists Advisory Committee and join the Home Guard. 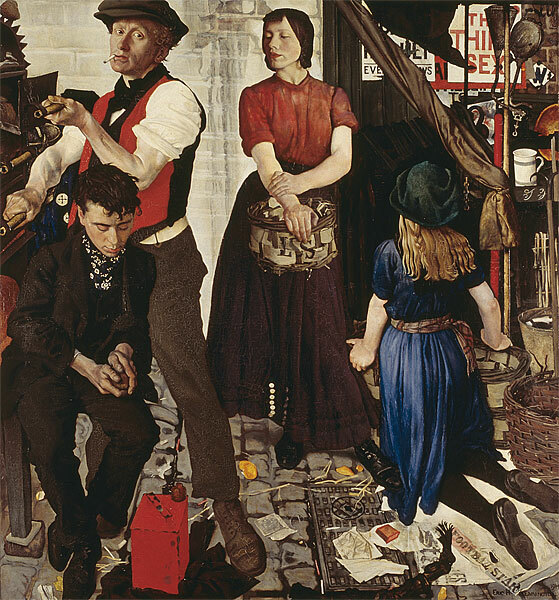 In July 1940, shortly after Kennington left the War Artists Advisory Committee the Committee held an exhibition of official war art at the National Gallery. The art critics and public were both pleased with what they saw and in particular the works of Eric Kennington which were said to have been the most popular. In particular his works depicting the generals and the sailors received the most praise. 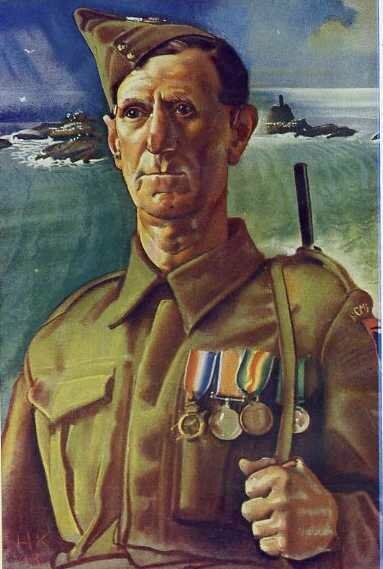 For all his criticism of some of his fellow volunteers he completed some wonderful portraits of them, such as Sergeant Bluett of the Cornwall Home Guard which he completed in 1943. 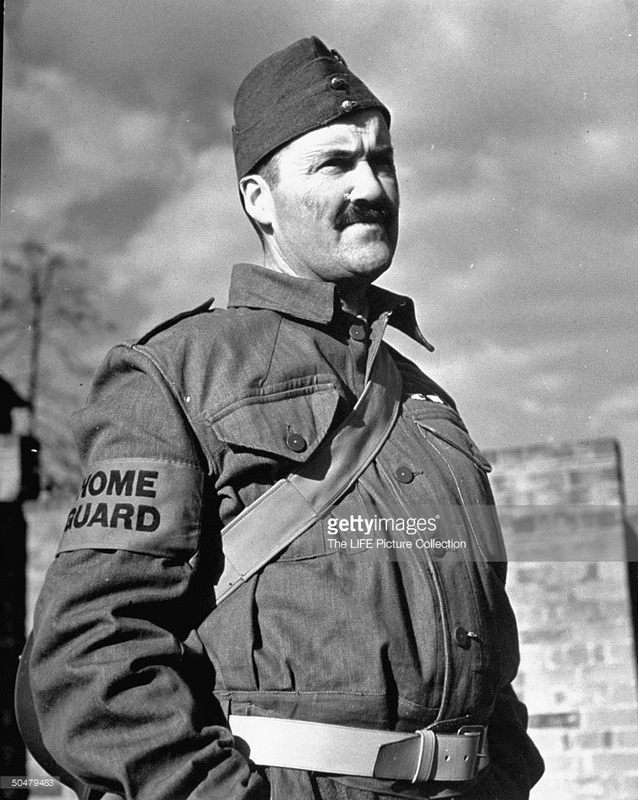 ….and Corporal Robertson of the City of Edinburgh Home Guard which he also completed in 1943. Both these paintings are housed in the Imperial War Museum. 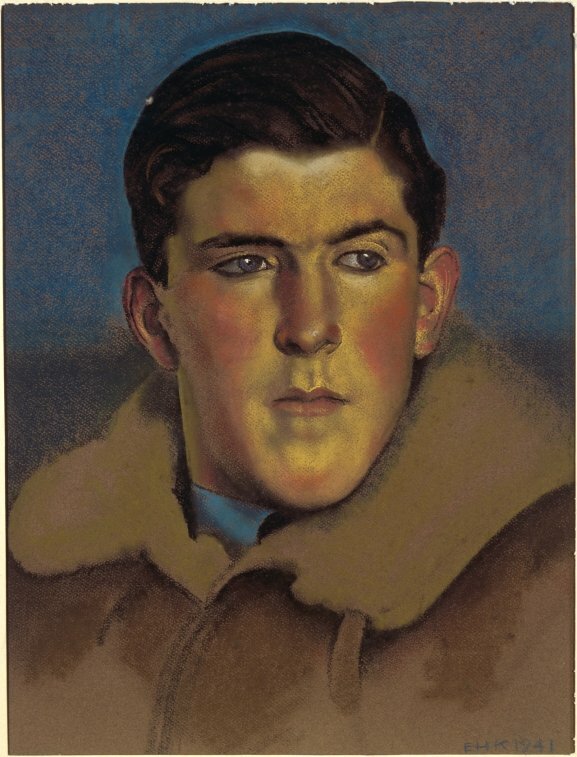 Kennington agreed to return as a war artist and the Committee offered him a commission to draw portraits of RAF personnel at a time when the Battle of Britain was at its fiercest and these men were often referred to as “fighting aces”. 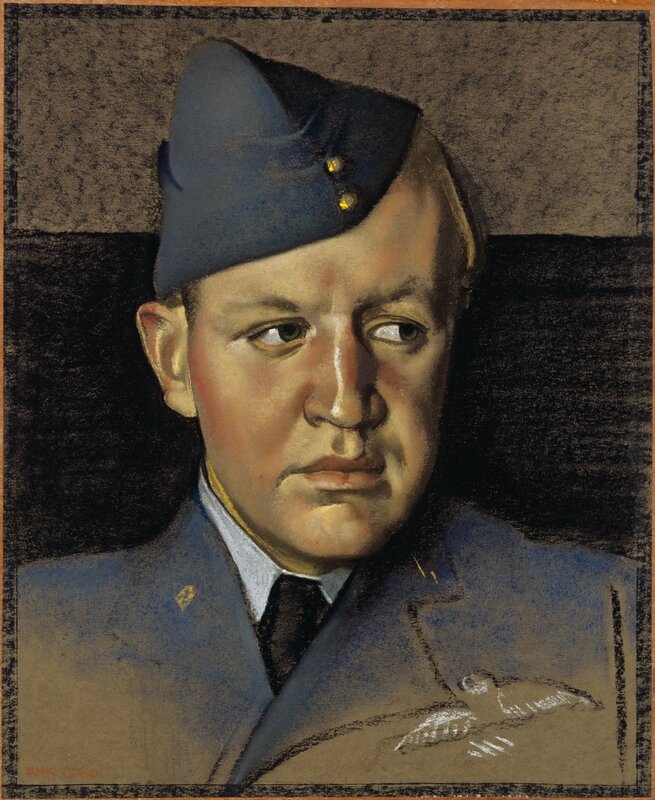 The pastel portraits were sensitive depictions of the air force heroes and many were used as illustrations in Kennington’s 1942 book Drawing the RAF. There is a simplicity about these portraits but the underlying thought that these were some of the men who would fight for and save our country, was unmistakeable. One must remember that the War Arts Committee would give Kennington a list of people who were to appear in his portraits. This caused a rift between Kennington and the Committee as Kennington believed that all the Committee wanted was portraits of senior officers and Kennington wanted to highlight some of the fighting men from the lower ranks. 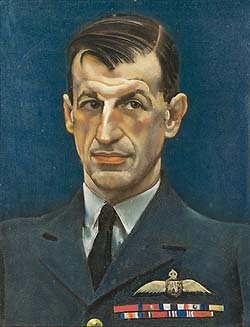 Once again Kennington threatened to walk away from his position as a war artist but he was such a great portraitist that he was talked out of his impending resignation by none other than the Chief of the Air Staff, Sir Charles Portal. 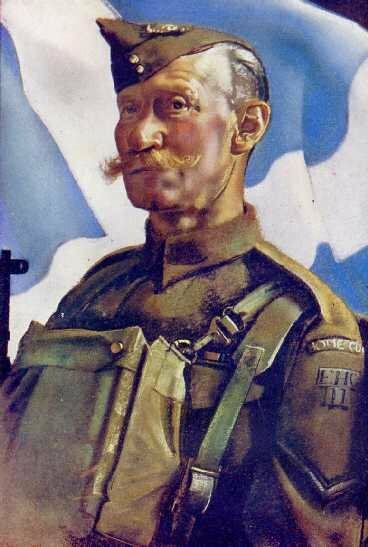 My final offering is a painting by Kennington which was used as one of the war posters in the series Seeing it Through. It was not of a fighting man or woman, but commemorated everyday heroism of normal people going about job in difficult and dangerous times. 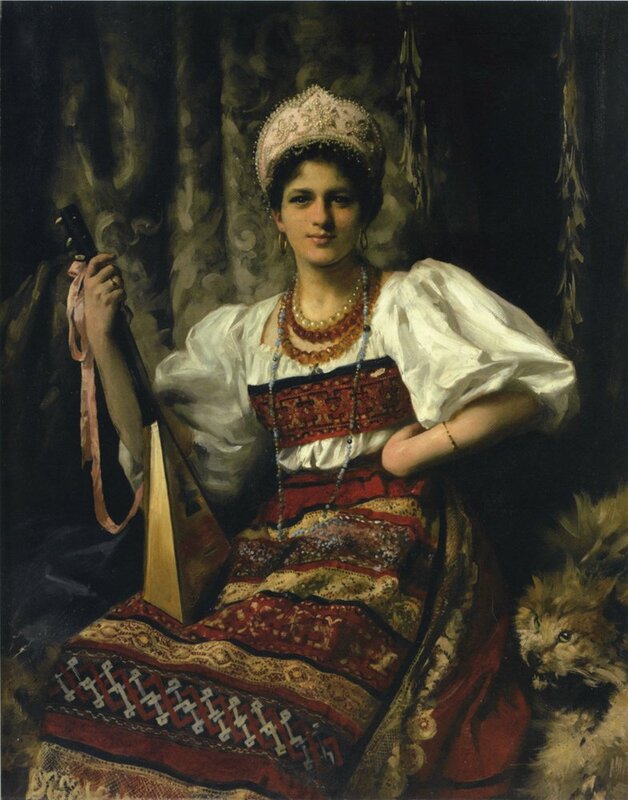 Kennington preferred not to use models for this type of work and in this work he used the woman herself as the model. It is of a young twenty year old woman, Mrs M.J. Morgan, who was a conductor on one London buses. 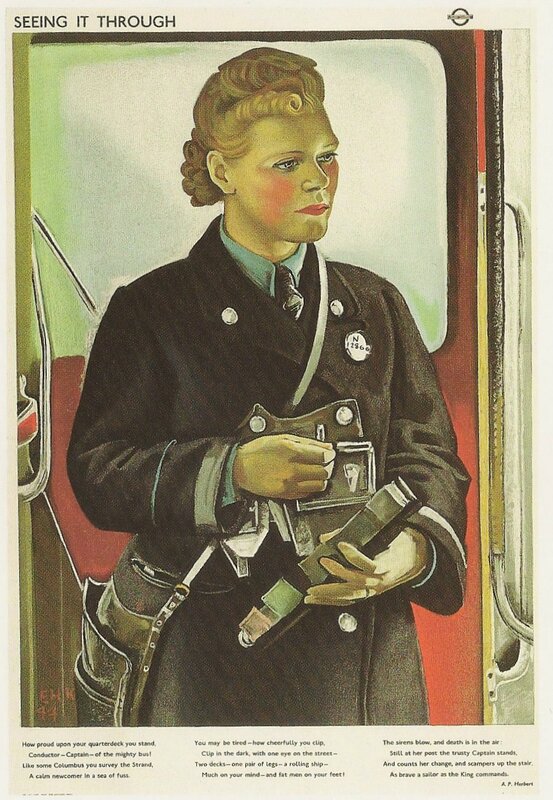 She had become one of the first generation of female bus conductors employed by London Transport in November 1940. She’d only just started her job as a “clippie” when the bus she was assigned to was caught in the blitz. She became an instant heroine when she shielded with her own body two young children, and then helped passengers who’d been injured when the bus was riddled with shrapnel from a bomb exploding nearby. Conductor- Captain of the mighty bus! Much on your mind and fat men on your feet ! 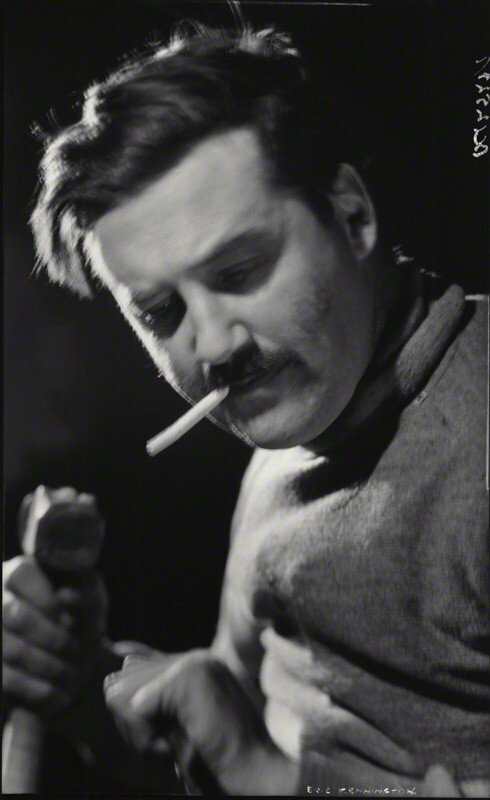 Eric Henri Kennington died in April 1960 aged 72. 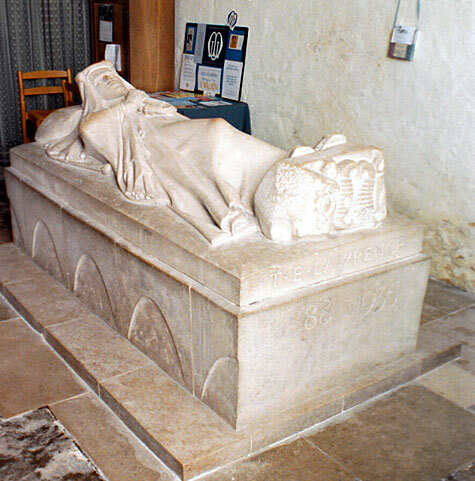 He is buried in the churchyard in Checkendon, Oxfordshire, where he was once the churchwarden and he is commemorated on a memorial in Brompton Cemetery, London.. 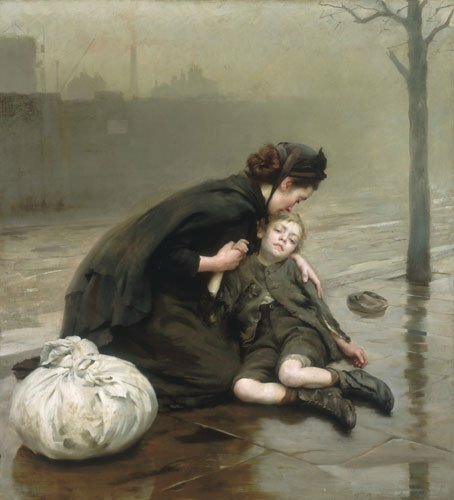 In my last blog I looked at the life and some of the paintings of Thomas Benjamin Kennington, the Victorian painter. 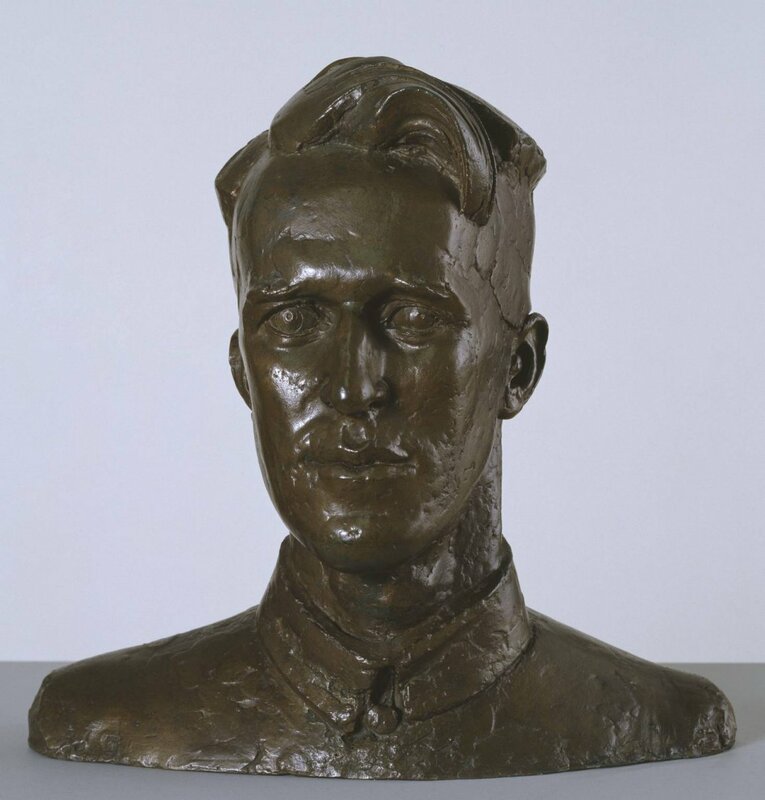 Today, in the first of two instalments, I want to look at the life and art of his son Eric Henri Kennington, who was an early twentieth century sculptor and artist. Eric was born in Fulham in March 1888. He was the second of two sons. 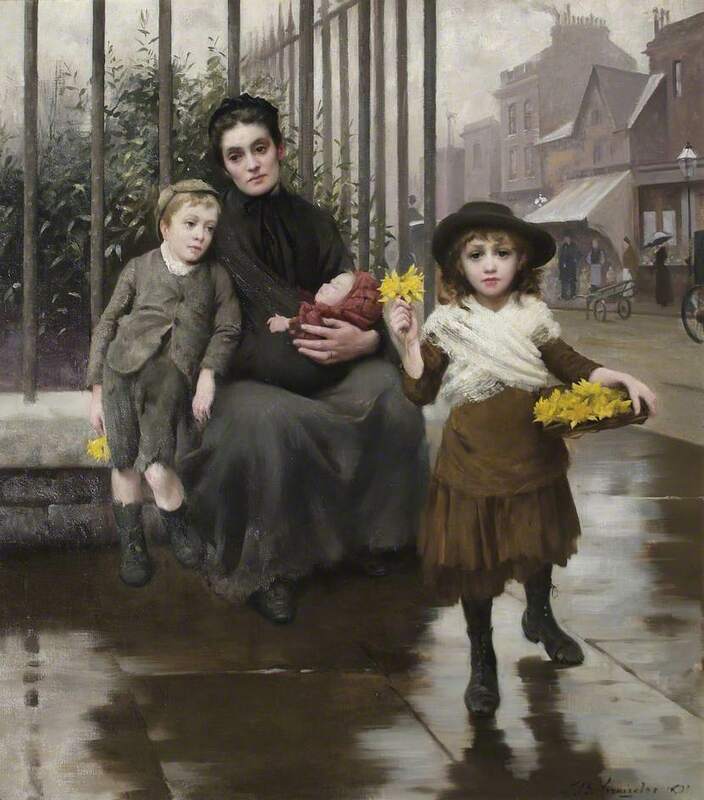 His father was the Victorian artist Thomas Kennington and his mother, Elise Nilla Lindahl Steveni, was of Swedish origin. 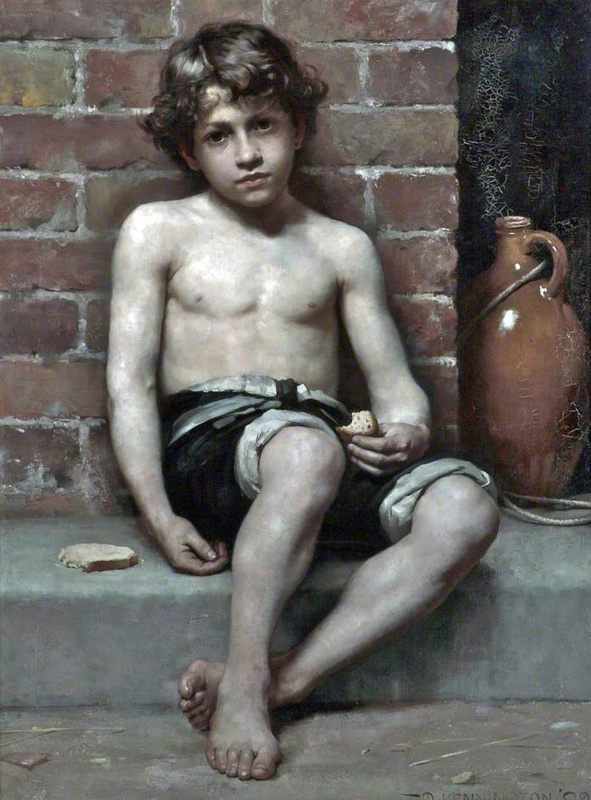 His mother died when Eric was just seven years of age. Eric was born into a middle-class professional household and received the best education possible, attending St Paul’s School, London, one of the original nine British public schools and from there he enrolled at the Lambeth School of Art. He started exhibiting his works of art at the Royal Academy in 1908 and by the start of the Great War in 1914 he had gained a reputation as a skilful painter. With the sale of the painting Kennington was able to set himself up in a studio in Kensington High Street. The Great War broke out in Europe in July 1914 and in the next month, Kennington took himself down to the recruiting office which was close to his studio, off Kensington High Street, and enlisted with the 13th Battalion, The London Regiment, Princess Louise’s Own Kensingtons. He was sent to the Hertfordshire village of Abbot’s Langley where he did his three months of basic training before being sent to France in November 1914. His days fighting on the front line were numbered as in mid-January 1915 he suffered a wound to his left foot which resulted in the amputation of his middle toe and he was extremely lucky not to have lost the whole of his left foot through infection. He was discharged from the army as being unfit for duty. It was during his time convalescing throughout the latter part of 1915, firstly in London, then Liverpool, that he painted one of his most famous works of art. It was a portrait of some infantrymen entitled The Kensingtons at Laventie, Winter 1914, which is now housed in the Imperial War Museum, London. The painting is extremely large measuring 140 x 152cms. The picture is a complex reverse painting on glass, where exterior layers of paint are applied first, giving the oils a particular clarity. In the painting, Kennington depicts part of his platoon standing around in a deserted street in Laventie, a small French village in the Pas-de-Calais region, close to the Belgium border. The village had been almost destroyed by shell fire. It is set in the winter of 1914 with snow on the ground. 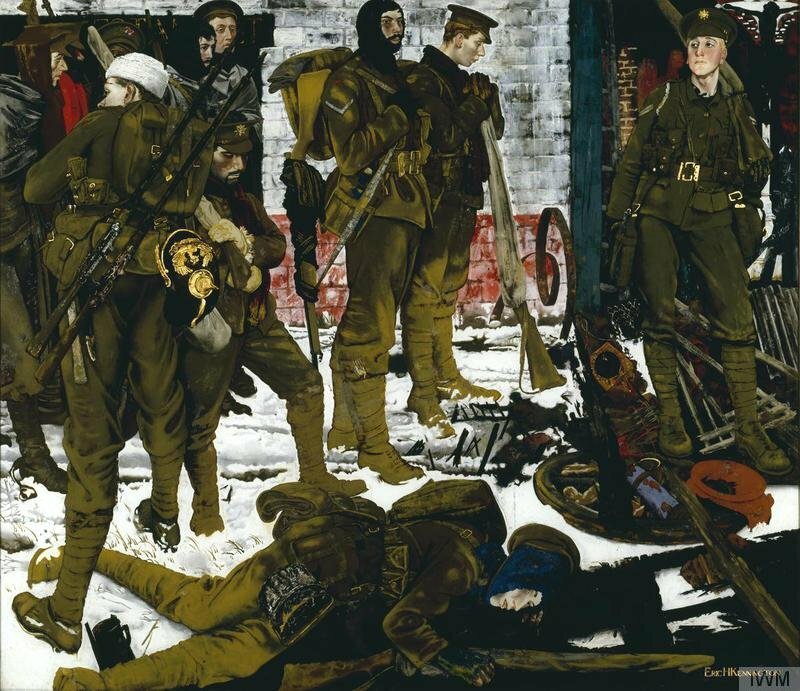 The soldiers in this painting were comrades from his unit, Platoon no. 7, C Company of the Kensingtons, and he has even included a portrait of himself in the scene. He is in the top left-hand corner wearing the balaclava. The men have arrived at the village after a long and tiring four days and four sleepless nights of duty in the trenches having had to endure continuous snowfall and temperatures at night which fell to twenty below freezing. It is a loose grouping of men, all but one standing. What is strange about their depiction is that no two men look in the same direction. The men seem disorientated and are awaiting their corporal to find out their next orders. Soon they were going to have to set off and endure a five-mile march to reserve billets, which were out of range of the German artillery. 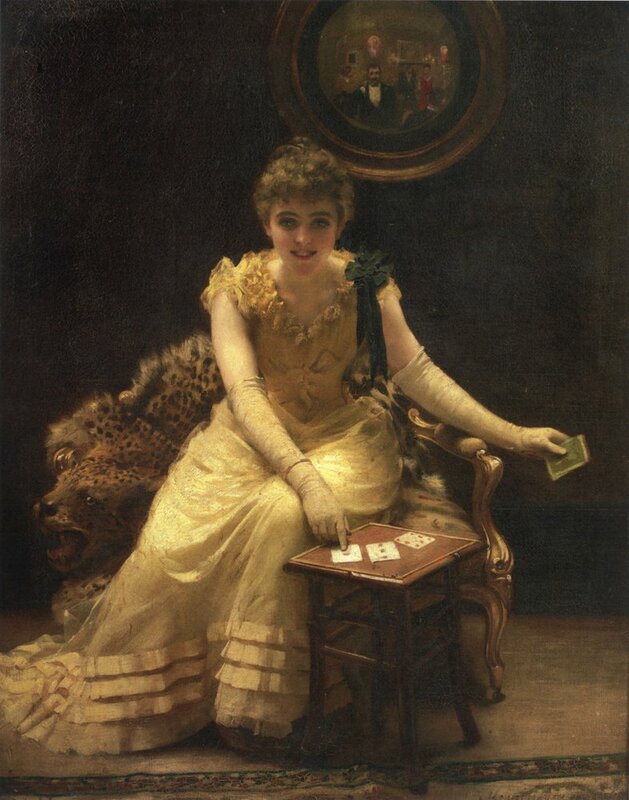 “…The portraits are of Private A. ‘Sweeney’ Todd (foreground) and (left to right) Private H Bristol in the red scarf, Private A. McCafferty carrying two rifles, the artist in balaclava, Private W Harvey, Private P A Guy, known as ‘Good Little Guy’, Lance-Corporal H Wilson in balaclava, Private M Slade resting both hands on his rifle and Corporal J Kealey…” . Kennington did not complete the painting until December 1915 and sadly by this time, ninety per cent of the once 700-strong battalion, which he had arrived with in France twelve months earlier, had become causalities. 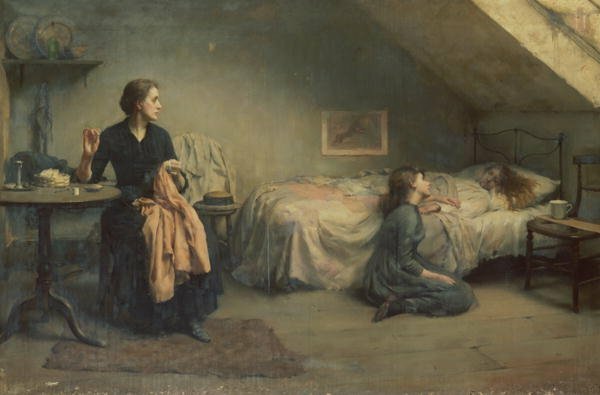 Many had died or had been severely wounded during the battles of Neuve-Chapelle in March 1915, and particularly Aubers Ridge in May 1915..
One of his first paintings as an official War artist was entitled Gassed and Wounded which he completed in 1918 and can now also be found in the Imperial War Museum. The setting is the interior of a field hospital. Eric Kennington made many sketches when he was at Casualty Clearing Station at Tincourt, a village in the Picardy region, some thirty miles east of Amiens. This point in time when Kennington made these sketches was at the time the German air force was bombarding the English lines, prior to their last big offensive. 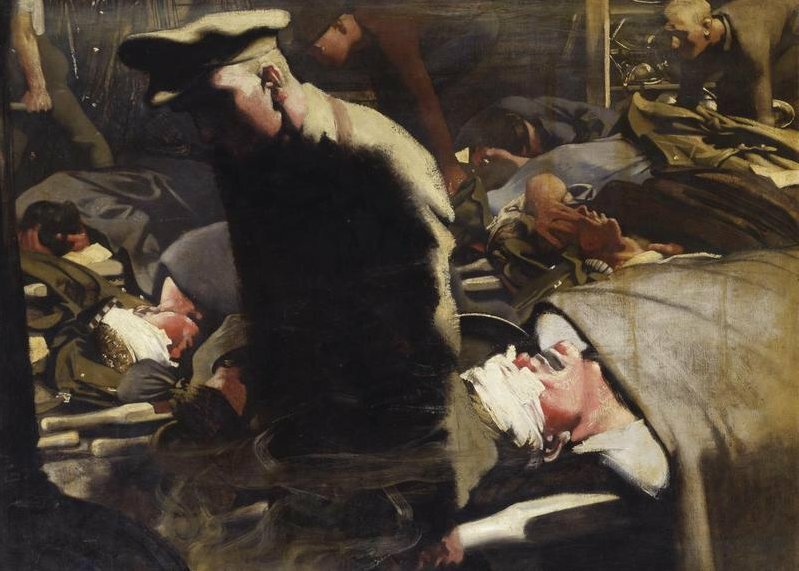 In the painting we see wounded soldiers, who have been gassed, lying on stretchers. Look at the way Kennington has depicted the agony of the man in the foreground. He lies on the stretcher. His head is bound with bandages. His eyes which have been damaged by the gas are covered. His face is contorted and his mouth is open as he cries out in pain. Kennington, had his differences with the Ministry of Information and parted company in September 1918. He was not unemployed for long as in November 1918, he signed up with the Canadian War Memorial Scheme. This scheme was established by the newspaper magnate Lord Beaverbrook in 1916. His aim was to commission official war artists to paint the Canadian war effort. The official war art programme would eventually employ close to 120 artists, most of them British or Canadian, who created nearly 1,000 works of art. Eric Kennington went back to France in November 1918 as a temporary first lieutenant attached to the Canadian Army and he attached himself to the 16th Battalion Highlanders of Canada, part of the 3rd Infantry Brigade of the 1st Canadian Division. Kennington remained in France between November 1918 and March 1919, during which time he made a series of over 40 studies of individual soldiers from the battalion who fought their last major battle of the war in October 1918. The next painting I am showing you is one entitled The Conquerors and featured men from the battalion of soldiers Kennington was assigned to as a war artist. This was not the original title of the work as when the painting was shown in an exhibition in Canada, it was entitled The Victims but there was an objection to that title from the battalion’s commanding officer, Lieutenant-Colonel Cy Peck, Kennington who wanted it to be changed and be renamed The Conquerors. 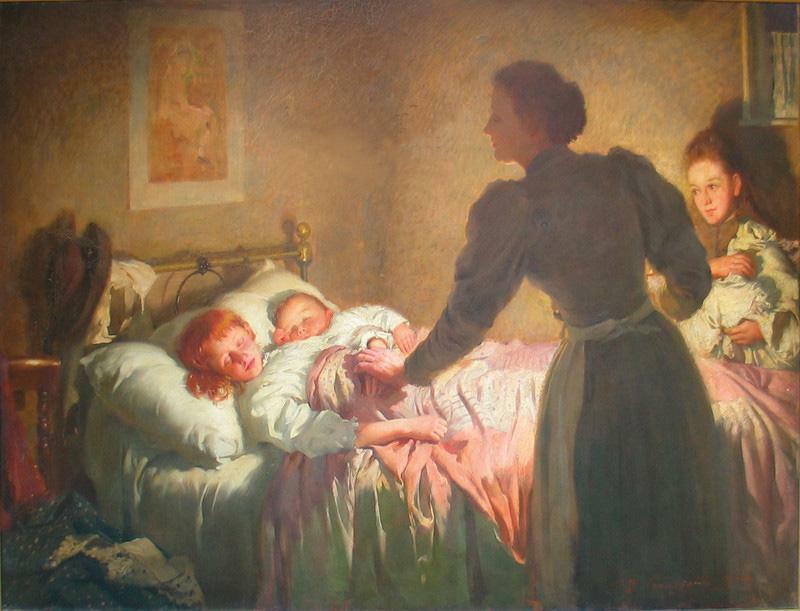 Cyrus Wesley Peck objected to the title “The Victims” as it was a somewhat defeatist title for the work of art and so it was changed to a more acceptable title, The Conquerors. 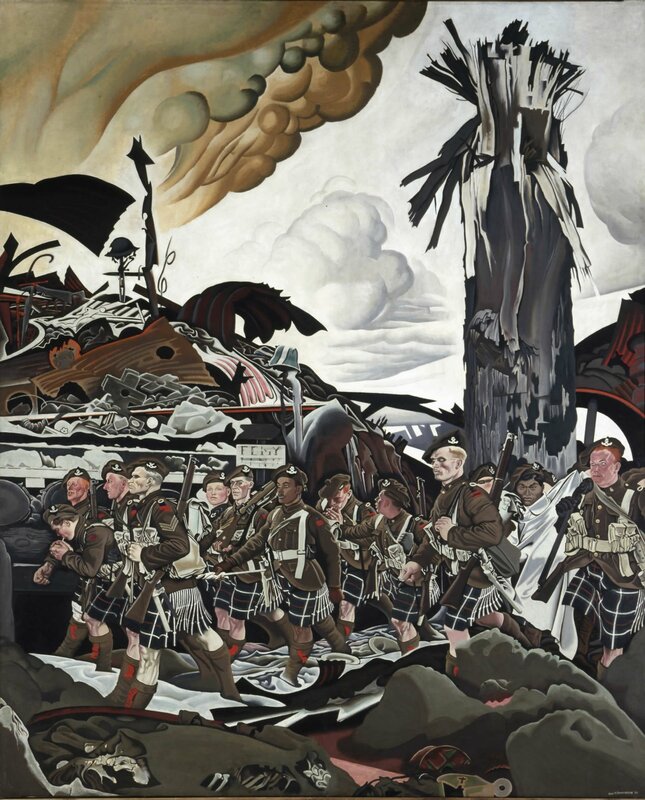 The painting depicts kilted Canadians of the 16th Battalion, marching through a battlefield littered with debris and informal graves. Look at the faces of the soldiers. Some have normal skin tones whilst others look much paler and these may represent the deceased. 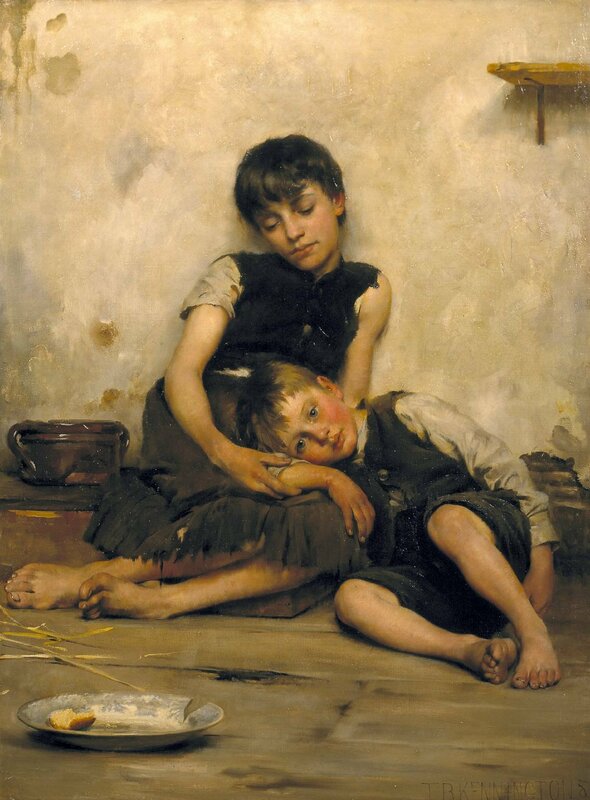 The painting is housed in the Canadian War Museum in Ottawa. The Conquerors was exhibited in Ottawa during the summer of 1920 and it was later returned to London where, in October and November of that year, it appeared at Kennington’s solo exhibition at the Alpine Club gallery in London. 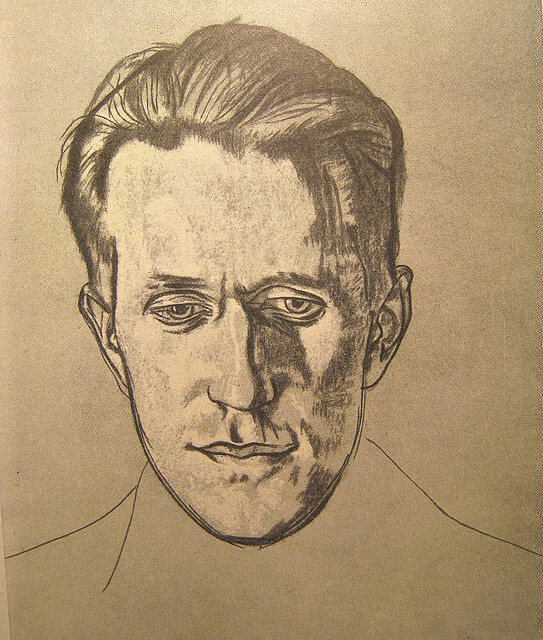 Whilst Kennington was present at the exhibition he met and was befriended by T.E.Lawrence the British archaeologist, military officer, and diplomat. Lawrence bought two of Kennington’s sketches depicting soldiers. 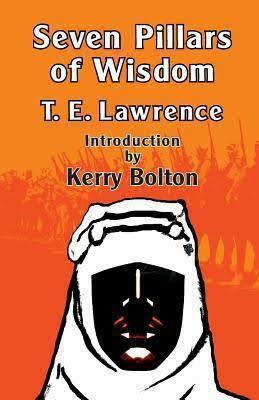 The intrepid Lawrence was a great influence on Kennington’s art and he even persuaded Kennington to come out to the Middle East to draw personalities who appeared in his account of the war with the Ottoman Turks that he was writing at the time, and which was eventually published as The Seven Pillars of Wisdom. The book was the autobiographical account of the experiences T.E. Lawrence had, while serving as a liaison officer with rebel forces during the Arab Revolt against the Ottoman Turks which lasted two years from 1916 to 1918. T E Lawrence soon became known as Lawrence of Arabia. 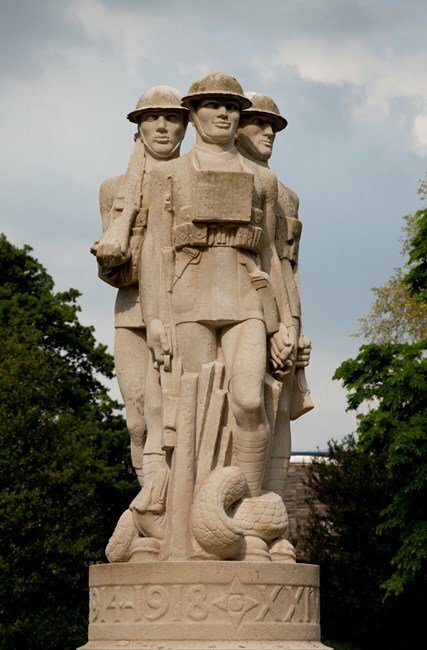 In 1924, Eric Kennington designed the War Memorial which can be seen in Battersea Park to commemorate the 24th London Division. 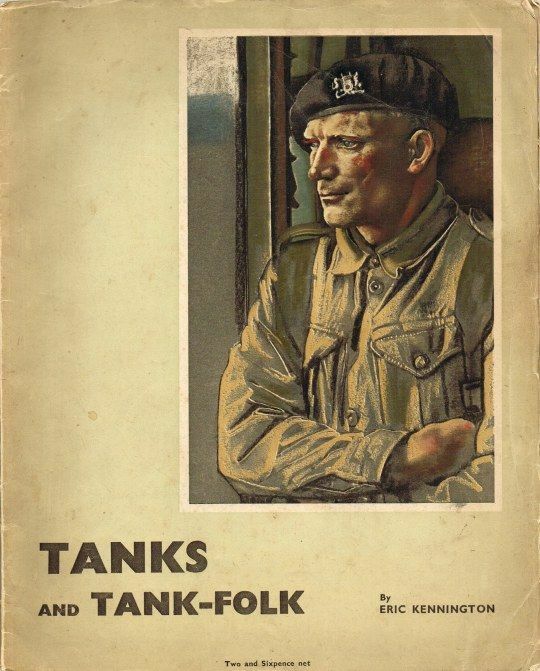 In the second part of my story of Eric Kennington I will look at his life between the world wars and also the paintings he completed as a war artist during the Second World War.